Book Review - Rebel Genius by Michael Dante DiMartino - Honk if you love justice! 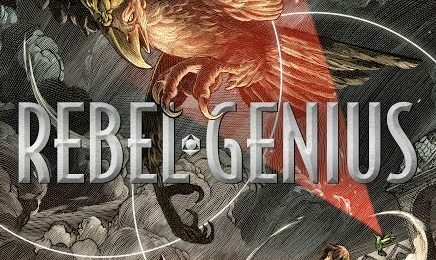 Rebel Genius is a new book from Michael Dante DiMartino (of Avatar: The Last Airbender and Legend of Korra fame), and if you are a fan of either of those shows, you’ll find a lot to love here. In fact, if there’s one negative to the book it’s that it hems a bit closely both to what DiMartino’s done before and some other classics of the fantasy genre. The story follows Giacomo, a 12 year old orphan who is also an artist. In Giacomo’s world, art is outlawed, and artists gain a birdlike companion creature (not unlike the daemon concept in the His Dark Materials series) with special powers tied to the creation of art called a ‘Genius’. When Giacomo gains his genius, he goes on the run and falls in with a mentor who has a hidden studio where he teaches other children how to use their gifts. They are opposed by both the Empress Nerezza (styling herself the ‘Supreme Creator’) who hunts down artists and destroys their Geniuses, rendering them zombie-like, and another renegade artist, Ugalino, who has made a Tulpa – basically a homonculus, or a living statue of immense power. He wants to tear down the world and remake it in his own image, and to do so he seeks the Sacred Tools – said to be the three items God used to make the world. All of this is well-trod ground for DiMartino – a group of almost-teens or teens with special powers set out on a journey to save the world. You’ll notice that I said they were opposed by the Empress and Ugalino – as usual for DiMartino, the good/evil aspect of the antagonists is fuzzy. You may not like what they do, and disagree with their methods, but they have a reason for what they are doing. The other kids tend to fall into tropes but I trust DiMartino to twist those expectations around (Sokka didn’t stay a misogynist dip for long). We see some of it by the end of this first book. The idea that art is magic is kind of precious, considering that DiMartino himself is a creative person. Sort of like how so many writers write books about writers doing stuff. But it’s easily forgiven as the Renaissance-inspired world is interesting. There’s a lot of talk about ‘sacred geometry’, and Zanobius is very obviously Da Vinci’s Vitruvian Man, which may drive some readers to go investigate classic art, which is never a bad thing. If you have a kid in the target range, Rebel Genius is a worthy purchase. Just don’t expect it to stray too far from the formula that DiMartino and Konietzko made (admittedly excellent) use of before. Thanks to NetGalley for the review copy. It’s currently scheduled for release October 4th.